Physical Education Makes Your Heart Race! My name is Tom Horner. I am a licensed health, physical education, and adapted physical education teacher. 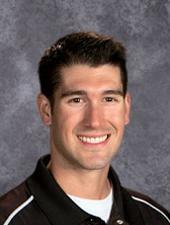 I am currently in my sixth year teaching physical education at Lincoln High School in Lake City, MN. Health and wellness is what I live by. My goal teaching is to give every student an opportunity to find something they enjoy doing in order for them to enjoy staying physically active for life. In my opinion, a modern physical education program is essential for motivating students on a daily basis and giving students the knowledge and resources in order to want to stay active. ​With my free time I enjoy spending time with family and friends, and staying active of course. I compete in full marathons, triathlons, and love good food! As a health, physical, and adaptive physical education teacher, introducing students to activities that prepares them for overall lifetime wellness is my priority. Lifetime wellness contributes to emotional, physical, mental, social, spiritual, and environmental health. Balancing these throughout life will ultimately result in the healthiest individual. Like the wellness spectrum, students should not weigh 90% of their effort into one specific subject or interest; I believe students should balance these out in order to acquire a wide variety of educational knowledge that one can use for their future. I also believe that having an educational environment that closely relates to the real world is how to best prepare students for their future and keep them interested. The experience that I bring to the table for teaching includes an understanding of the wide variety of abilities the students have. I believe it’s essential for each student to be challenged yet, have a fair chance to be successful in any activities that I teach. This involves understanding that there are introductory, competent, and proficient students in every class and therefore I challenge myself each day to create FUN and unique lessons that meet the needs of every individual in the class.